Who here likes Balloon Boy? One thing that frustrates me more than anything else in the land of FNaF lore, is how people treat the #GTLive teasers. The larger community does not seem to recall that there was actual context to these messages. These messages took place during the #GTLive stream for FNaF, in which a small harem of theorists discussed FNaF. At least, for as long as they were permitted. They have context that nearly everyone overlooks. 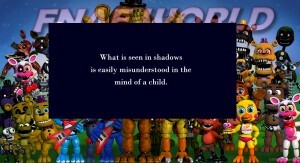 Context that invalidates a fair few uses of these lines out in the wilderness of FNaF theorising. So, using a live reference and some time judging, we can find out approximately what Scott was reacting to, and at what time he had reacted to it. This post will not answer these hints thoroughly just yet. They just serve to outline what the context is. I will do an observation on the hints themselves in a while, when the FnaFWorld map and the faz-cams are finished. The first clue Scott dropped was “In the FNaF4 minigame, why would the tiny toy chica be missing her beak?”. This first hint was eventually found at the timestamp 1:15:55, however, Scott had emailed Dawko about it prior to releasing the information on the site. The moment we heard about Dawko wanting to get back on the stream was at 1:13:08, so we must account for several factors here. First, we must account for the 30 second stream delay. This delay is present in all livestreams. this rolls back the time to about 1:12:38. Next, we must account for the time it took for the email to get from Scott, to Dawko, and then contact to form from Dawko to MatPat. Sadly, there is little to no way of telling how long this process took. However, prior to that time, easter eggs were being discussed at 1:06:20 onwards to the 1:13:08 timestamp, along with show-dressing in women’s clothing. These talks were primarily the easter eggs relating to Cawthon’s portraits, and the “87”s littered in the source code during FnaF4’s teasing. They were expressing their frustration at the potential red herrings, and how they muddied the timeline. We can assume this note is a direct reply to that segment, and that Scott was not making a statement on the wearing of women’s clothes. That court is still out on that opinion. Therefore, this question can now be interpreted in context. It can be seen as “you say there are no easter eggs, but why are there so many red herrings?”, to which, Scott replies with “In the FNaF4 minigame, why would the tiny toy chica be missing her beak?”. This was discovered at 1:21:52. by the stream. Once more, we must account for the 30 second delay, taking it to 1:21:22. This one was much faster. it utilised the fanbase by updating the main site, after doing so for the first hint. As it stood, the first hint arrived faster via the site, than via Dawko. Therefore, these methods are much speedier than the previous ~6 minute gap. We must account for Scott updating the site, fans picking it up, and then spamming Dawko with the tweets. It’s safe to say, the moment it went live, it was found and tweeted. The fanbase can be a rabid monster, consuming all scraps of lore and website updates like how piranha consume meat. So we only need to account for the reaction times of the crew. Sadly though, this turns up no contextual results. nothing is mentioned in the prior minutes relating to Shadows. It is safe to say that this hint is not related to the content of the stream, but perhaps Scott intended to quick-fire this question as soon as the first was asked and pondered. I believe he might have even left the hints at this point. There were two red herrings mentioned when Scott started this, and then two questions he raises to help the community. But then, we get to the meaty one. the one everyone over-analyses. This line has single-handedly confused more people than the previous two combined. Introduced at 1:26:22, “Four games. One story.” broke on the stream, and was promptly misquoted not only by the fandom, but by MatPat and the #GTLive crew themselves. The team cannot really be blamed, as it was in the heat of the moment. However, everyone else watching should have taken note of the dialogue that had been taking place between Scott and #GTLive up until that point, noting that these questions are responses to the stream. Once more, we take into account the 30 second delay, taking us to 1:25:52. So, we need to skip back shortly before that to get the context. This argument implies a complete timeline. 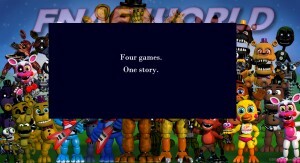 There is one story, and the four games tell that one story. It is my belief that this means the dream theory is bunk. That, alongside the Nightmare Mangle’s non-canon status. That said, I can see it being used in other ways to suit other narratives. However, it was explicitly contextual. It was not said “in a vacuum”, it was said in direct reply to MatPat and #GTLive. Context is so important. It is a massive shame that the community at large misinterpreted the hints without the context of the stream, in relation to the easter eggs. the “Chica’s Beak” hint was in response to the red herrings present in FNaF4. the “Shadows” hint was a follow-up, trying to create a dialogue between #GTLive and Cawthon. Getting a second question in there for #GTLive to chew on. the “Four Games” hint was a direct response to the “FnaF2 is a dream/all games so far are a dream” theory MatPat put forward.